The weather was still miserable and made the crossing of Guadarrama almost unbearable. 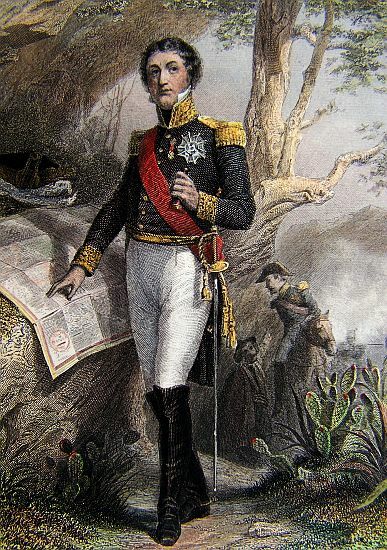 Once over the mountain range they reached Valladolid, where Napoleon sent Soult after Moore, and Moncey onto Saragossa, while Lannes remained idle. He would not remain so for long. General Palafox had 34,000 troops and 160 cannons at Saragossa, but he also had the entire population of the city at his command. As soon as Palafox arrived there, he ordered the fortifications strengthened, and many of the houses and churches were turned into small fortresses. When Moncey arrived with his 15,000 troops, he was obviously outnumbered. 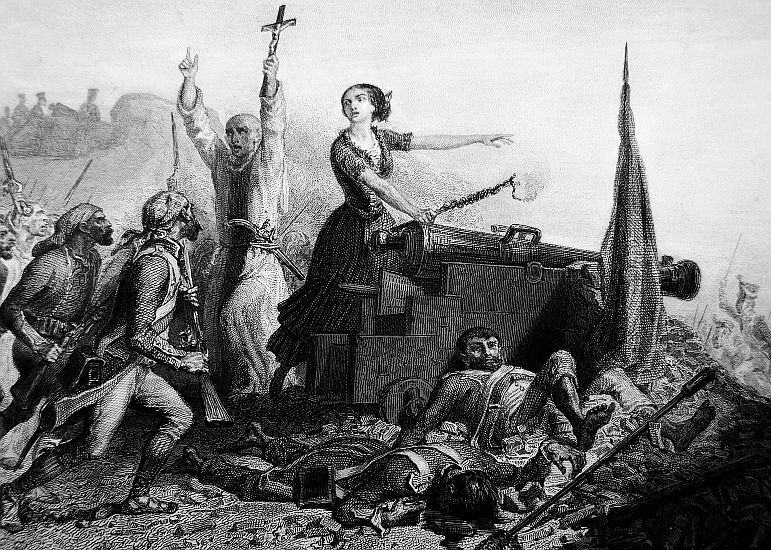 When Moncey began the siege, Mortier was ordered to join in on the fight. 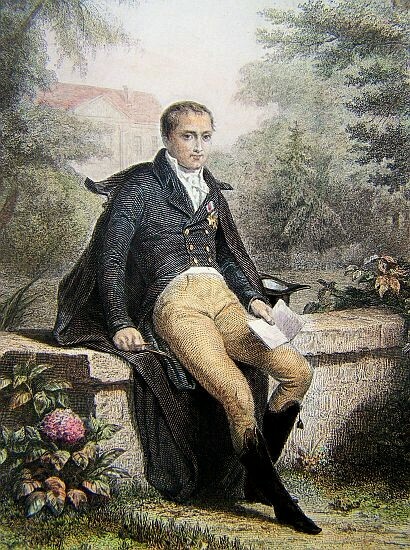 Napoleon wanted quick results and when Moncey failed to produce, he was replaced by Junot. 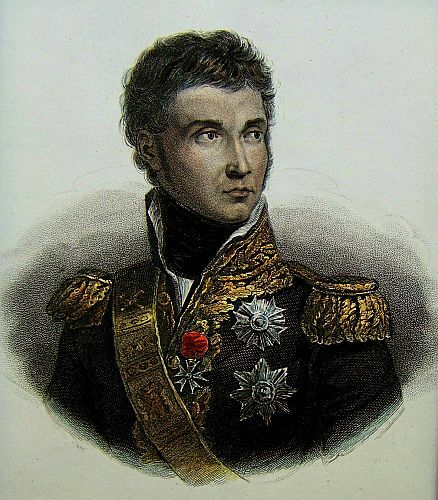 When Junot was unable to take the city, Napoleon replaced him with Lannes on the 9th of January 1809. 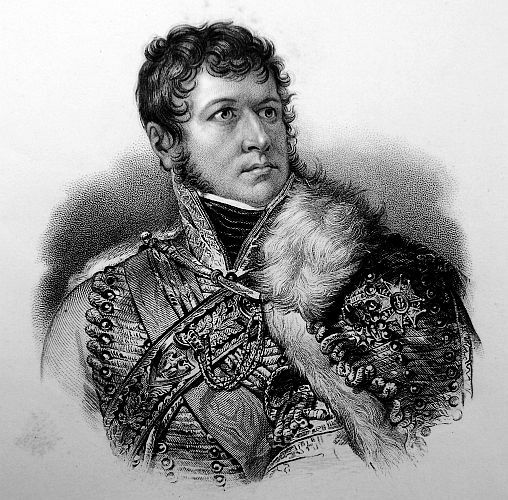 Lannes took command on the 22nd of January, and immediately went on the offense. He started by ordering Suchet to join him with his 9,000 troops. 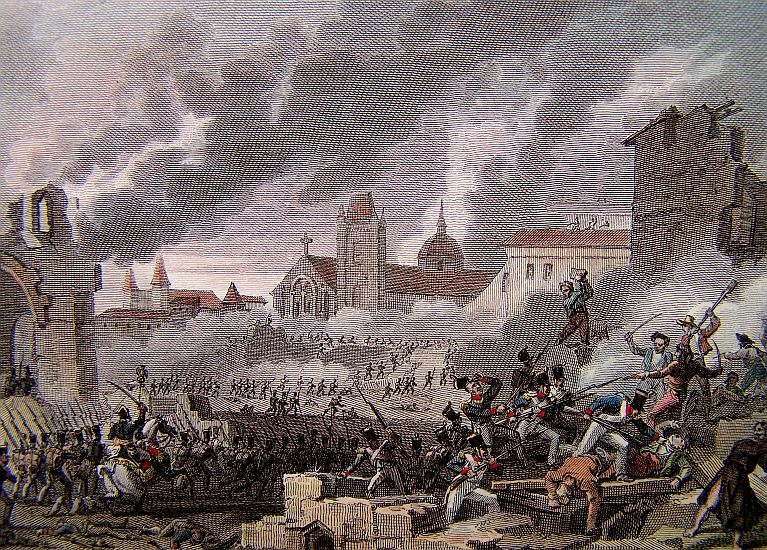 Lannes opened up on the city with his artillery which weakened some of the its walls, along with houses and other structures. He sent his infantry into some of the breaches and they managed to capture some key positions, which allowed the French to enter the city. However, entering the city was not an easy task and it led to many French casualties. Once inside, Lannes would have to fight house to house and street by street, and this type of warfare would be brutal for all participants. 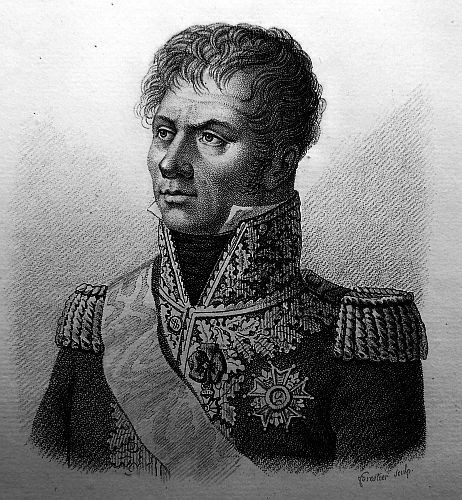 Lannes then ordered his engineers to demolish as many structures as possible. 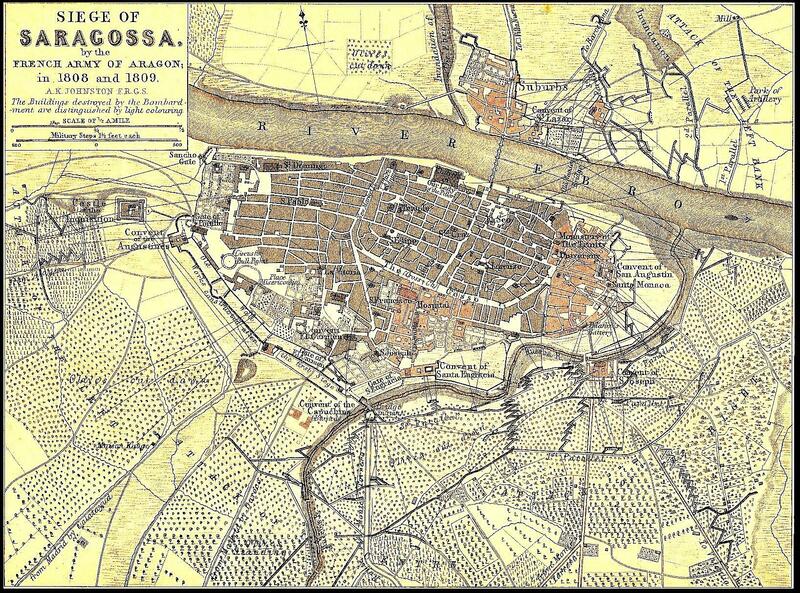 After a month of vicious fighting which left over 50,000 dead from battle and Typhus, the city of Saragossa capitulated on the 19th of February 1809. Lannes would return to Paris a changed man. That part of the treasure of the enemy which has fallen into our hands is 1,800,000 francs. The inhabitants assert that the English have carried off eight to ten millions. The English General deeming it impossible that the French infantry and artillery should have followed him, and gained upon him a certain number of marches, particularly in the mountains so difficult as those in Gallicia, thought he could only be pursued by cavalry and sharpshooters. He took, therefore, the position of Castro on his right, supported by the river Tombago, which passes by Lugo, and is not fordable. The Duke of DALMATIA arrived on the 6th in presence of the enemy. He employed the 7th and 8th reconnoitring the enemy, and collecting his infantry and artillery, which were still in the rear. He formed his plan of attack. The left only of the enemy was attackable–he manoeuvred on their left. His dispositions required some movements on the 8th, and the Duke determined to attack on the 9th, but the enemy retreated in the night, and in the morning our advanced guard entered Lugo. The enemy left 300 sick in the hospitals, a park of 18 pieces of cannon, and 300 waggons of ammunition. We made 700 prisoners. The town and environs of Lugo choked with the bodies of English horses. Hence, upwards of 2500 horses have been killed in retreat. The English are marching to Corunna in great haste, where they have 400 transports. They have already lost baggage, ammunition, a part of their most material artillery, and upwards of 3000 prisoners. On the 10th our advanced guard was at Betanzos, a short distance from Corunna. The Duke of ELCHINGEN is with the corps near Lugo. In reckoning the sick, missing, those who have been killed by the peasants, and made prisoner by our troops, we may calculate the loss of the English at one-third of their army. They are reduced to 18,000 men, and are not yet embarked. From Sahagun they retreated 150 leagues in bad weather, worse roads, through mountains, and days closely pursued at the point of the sword. It is difficult to conceive the folly of their plan of campaign. It must be attributed, not to the General who commands, and who is a clever and skillful man, but to that spirit of hatred and rage which animated the English Ministry. To push forward in this manner 30,000 men, exposing them to destruction, or to flight as their only resource, is a conception which can only be inspired by the spirit of passion, or the most extravagant presumption. Lugo was pillaged and sacked by the enemy. We cannot impute these disasters to the English General; it is the usual and inevitable effect of forced marches and precipitate retreat. Zamora, whose inhabitants had been animated by the presence of the English shut their gates against General MANGETET: General DORNEAU proceeded against it with four battalions–he scaled the city, took it, and put the most guilty to the sword. Gallicia is the province of Spain which manifests the best disposition: it receives the French as deliverers. Valladolid has taken the oath to King JOSEPH. The circumstances of Saragossa was not yet resolved upon; that was considered as inexpedient; and a free communication was still left open, in order that the Insurgents might be informed of the defeat of the English, and their infamous flight out of Spain. It was on the 16th of January that the English were driven into the sea at Corunna and it was on the 26th that the operations before Saragossa were seriously begun.The Duke of MONTEBELLO arrived there on the 20th, in order to assume the command of the siege. As soon as he was assured that the intelligence which was brought into the town had no effect, and that a few monks governed the minds of the people, he resolved to put an end to these indulgences: 50,000 peasants were collected on the left bank of the Ebro: at Pardiguera the Duke of TREVISO attacked them with three regiments; and, notwithstanding the fine position they possessed, the 64th regiment routed them, and threw them into disorder. The 10th regiment of hussars was on the plain to receive them, and a great number remained upon the field of battle. Nine pieces of Cannon and several standards were the trophies of this victory. At the same time, the Duke of MONTEBELLO had sent the Adjutant Commandant GUSQUET to Zuera, in order to disperse an assemblage of insurgents; this office attacked 4,000 of them with three battalions, overthrew them, and took four pieces of cannon, with their carriages and horses. General VATTIER was at the same time sent with 300 infantry, and 200 cavalry, towards Valencia. He met 5,000 insurgents at Alcanitz, compelled them, even in the town, to throw down their arms in their flight; he killed 600 men, and seized magazine, provisions, and arms; among the last were 100 English muskets. The Adjutant Commandant, CARRION NIZOS, conducted himself gloriously at the head of a column of infantry. 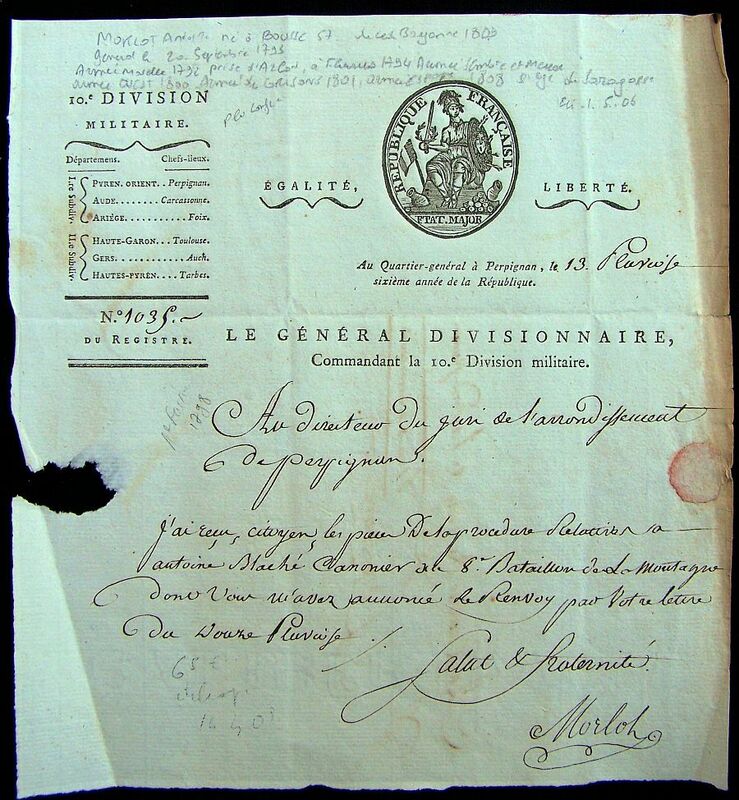 Colonel BURTHE, of the 4th regiment of Hussars, and the Chief of Battalion, CAMUS, of the 28th regiment of Light Infantry, distinguished themselves. These operations took place between the 20th and 26th of January. 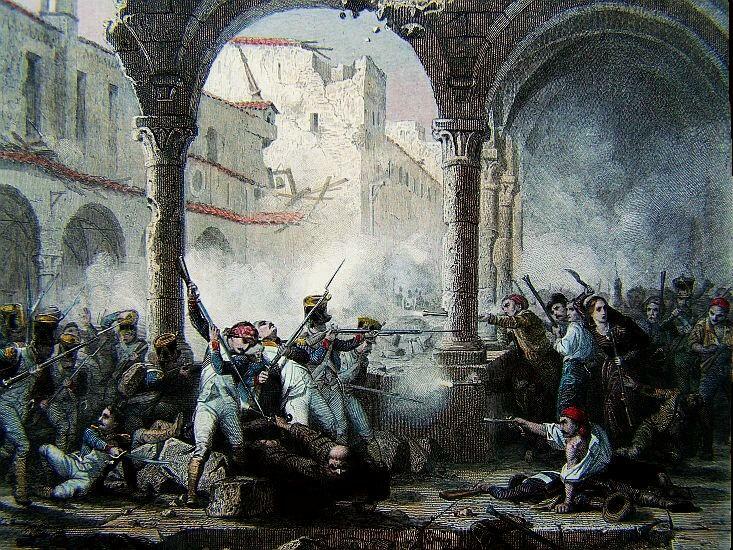 On the 26th the town was seriously attacked, and the batteries were unmasked, and at noon on the 27th the breach was practicable in several places; the troops were lodged in the monastery of San-in-Gracia. The division of GRANDJEAN entered some thirty houses. The Colonel CALOISEKI and the soldiers of the Weixel, distinguished themselves. 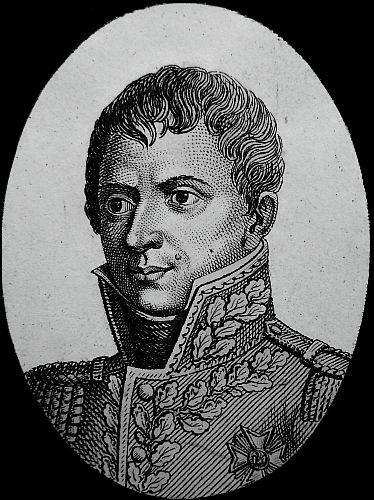 At the same moment the General of Division MORLOT, in an attack upon the left wing, made himself master of the whole fore ground of the enemy’s defense. Captain GUETTEMAR, at the head of the pioneers, and thirty six grenadiers of the Forty Fourth regiment, had, with a rare intrepidity, ascended the breach. M. BABIESKI, an Officer of the Voltigeurs of the Weixel, a young man 17 years of age, and covered with seven wounds, was the first who appeared upon the breach. 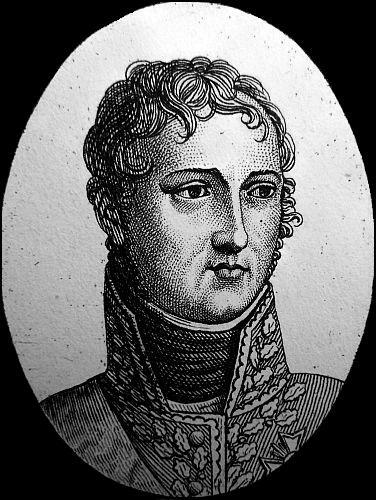 The Chief of Battalion, LEJUNE, Aide-de-Camp to Prince of NEUFCHATEL, distinguished himself, and received two slight wounds. The Chief of Battalion, HAXO, is also slightly wounded, and likewise distinguished himself. On the 30th, the monasteries of the Monique and the Greek Augustines were occupied. Sixty houses were possessed by undermining. The miners on the 14th regiment distinguished themselves. On the 1st of February, General LACOSTE received a ball, and died in the field of Honour. He was a brave and distinguished officer. He has been lamented by the whole army, but more especially by the EMPEROR. 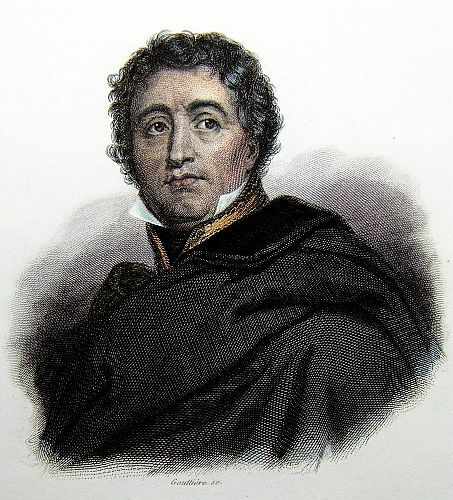 Colonel REGNIAT succeeded him in the command of the engineers, and in the management of the siege. The enemy defended every house; three attacks were made by the mines, and every day several houses were blown up, and afforded the troops an opportunity of stationing themselves in other houses. Thus we proceeded to the Cosso (a great street in Saragossa) where we made ourselves masters of the buildings of the Public School and University. The enemy endeavoured to oppose miners to miners; but less used to this sort of operation, their miners were every day discovered and suffocated. This mode of besieging rendered its progress slow, but sure, and less destructive to the army. While three companies of miners and eight companies of sappers carried on this subterraneous war, the consequences of which were so dreadful, the fire on the town was kept up by mortars. Ten days after the attack had begun, the surrender of the town was anticipated. The army had possessed itself of one third of the houses, and fortified itself in them. 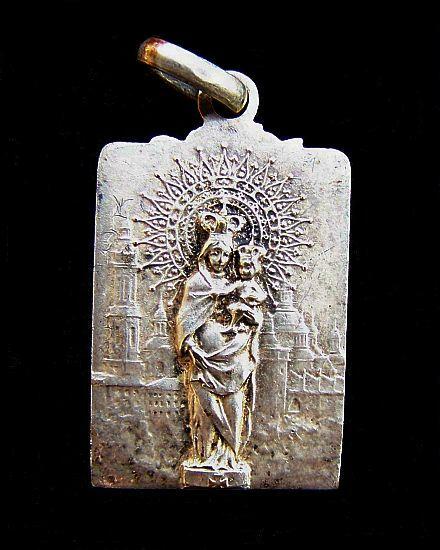 The Church which contained the image of Our Lady of Pillar, which by so many miracles had promised to defend the town, was battered down by bombs, and no longer inhabitable. 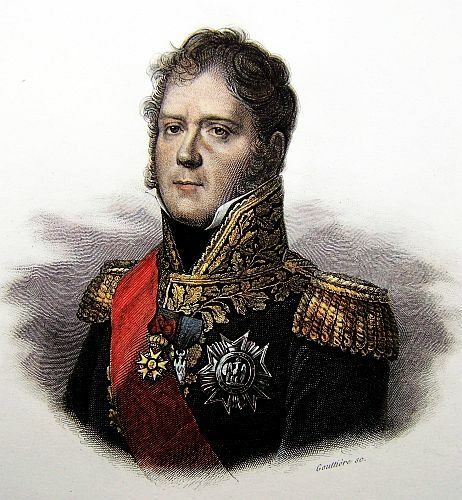 The Duke of MONTEBELLO deemed it necessary to take possession of the left bank of the river, in order that his fire might reach the middle of the town. The General of Division, GAZAN, made himself master of the bridge by a sudden and impetuous attack, on the morning of the 17th February. A battery of fifty pieces was played off at three o’clock in the afternoon. A battalion of the 28th regiment attacked and took possession of a very large monastery, the walls of which were of brick, and from three to four feet thick. General GAZAN then repaired with rapidity to the bridge, over which the insurgents made their retreat to the town; he killed a vast number, made 4000 thousand prisoners, amongst whom were 2 Generals, 12 Colonels, 19 Lieut. Cols. and 230 Officers. He took 30 pieces of artillery. Nearly all the troops of the line in the town had beset this important part, which had been threatened since the 10th. At the same moment the Duke of ABRANTES entered the Casso through several covered ways, and by means of two small mines, blew up the extensive buildings of the Schaals. After these events, terror was spread throughout the town. The Junta, in order to procure delay, and obtain tome to abate the terror of the inhabitants, sought a parley; but their bad faith was known, and this artifice was useless. Thirty other house were possessed by undermining or by miners. At length, on the 21st of February, the whole town was possessed by our troops; 15,000 infantry and 2000 cavalry laid down their arms at the gate of Portilla, and 40 flags and 150 pieces of cannon were delivered up. The insurgents lost 20,000 men during the siege; 13,000 were found in the hospitals; 500 died daily. The Duke of MONTEBELLO would allow no capitulation to the town of Saragossa. He only published the following provisions’ – “The garrison shall at noon, on the 21st, lay down their arms at the gate of Portilla, where they shall remain prisoners of war. 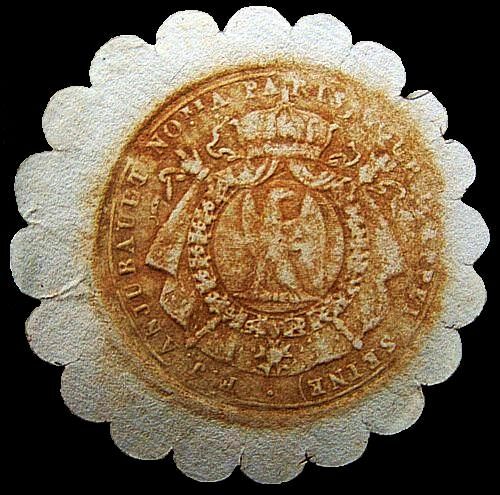 Those of the troops of the line who are willing to take the oath to King JOSEPH, may be allowed to enter into his service. In case this entrance shall not be permitted by the Minister of War to the King of Spain, they shall be prisoners of war and sent to France. The worship of God shall be reverenced. All the artillery and ammunition of every kind shall be delivered up. All the arms shall be deposited at the doors of the different houses, and collected by the respective Alcaldes.” The magazines of corn, rice and fruit, which have been found in the town are very considerable. 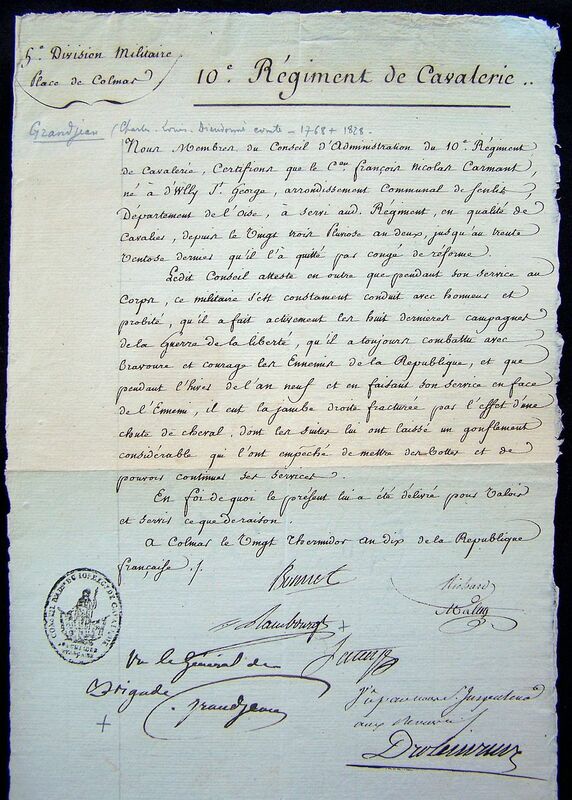 The Duke of MONTEBELLO has nominated General LAVAL Governor of Saragossa. A Deputation of the Priesthood and different inhabitants has set out fro Madrid. PALAFOX is dangerously ill. He was the object of contempt of the whole hostile army, who accused him of arrogance and meanness. He was never seen where their was any danger. 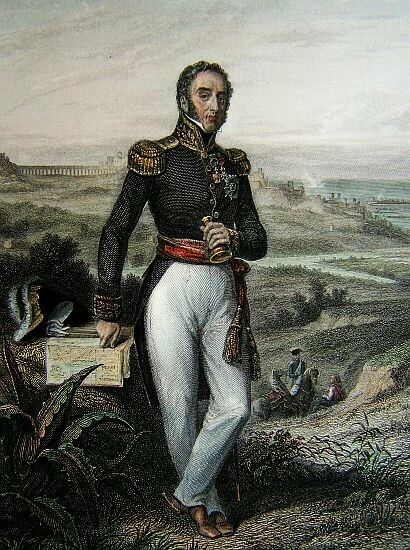 The Count de FUENTES, Grandee of Spain, who had been arrested by the insurgents two months ago on his estate, was found in a dungeon of eight feet square, and released: no idea can be formed of the miseries he had undergone. From Bayonne, by letter dated the 28th ult. we learn the following: The town and fortress of Iaca having surrendered, General GOUVION ST. CYR is now besieging Tarragona, and in which town the Spanish REDING commands. The said General REDING was severely wounded in the last engagement, but not killed, as was reported. Last night Marshal LANNES, Duke of MONTEBELLO, passed through this place, in his return from Spain.